In looking back at our history we were reminded of the contributions made not only to Carnival but to the development and growth of Leeds over the years. Capturing where we started and how we came to be one of the UK’s most adored Carnivals is a key part of our history. As well as showcasing artefacts and ephemera, a special 50 Years of Leeds West Indian Carnival exhibition at The Tetley gallery in Leeds also featured a uniquely illustrated piece which charted the heritage and beginnings of the carnival set against a Leeds map of the Chapeltown area of Leeds where it all began, the various routes the Carnival parade and which picks out key moments over half a century to 2017. 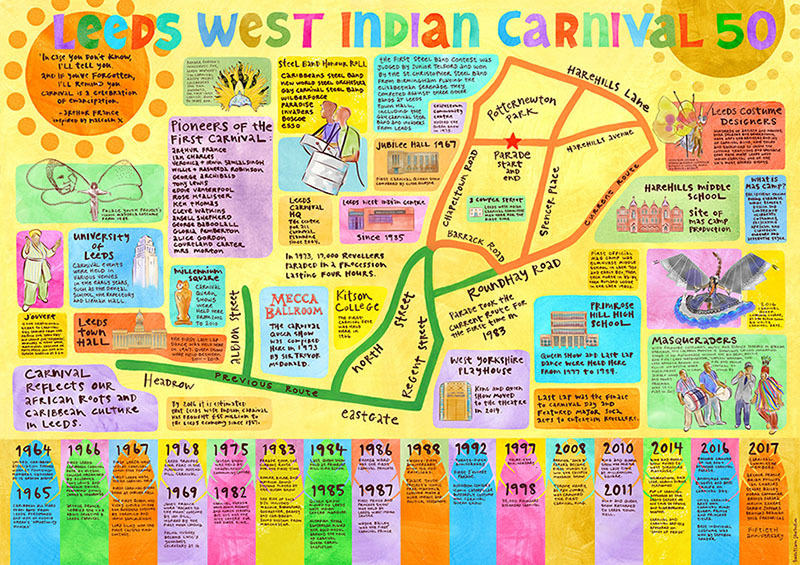 Created by artist Teresa Flavin who worked closely with carnival contributors to explore the fascinating history, the resulting map was a popular feature of the exhibition. The large scale size map is also a useful educational resource. “My aim was to create an aesthetically pleasing map, but also a learning tool and an artefact of Leeds Carnival’s legacy that functions as a visual document informing the viewer about the many diverse aspects of its evolution. I am honoured to have made a small contribution to the preservation and dissemination of Leeds Carnival’s rich heritage”, Teresa added. The map is a great tool which we are happy to share with schools, colleges, and community groups. A PDF of the map suitable for printing on an inkjet printer to A1 size can be downloaded here.